"After only two seasons,"" cheered Clive Barnes in the New York Post, "[New York] City Center's series Encores! Great American Musicals in Concert has become a Broadway fixture, both loved and indispensable." Winner of a 1995 Outer Critics' Circle Special Achievement Award, Encores! finished its second season in May with four performances of PAL JOEY (see story, p.5); previous entries in the concert series included FIORELLO!, ALLEGRO (see HAPPY TALK, Vol. I, No. 3), LADY IN THE DARK, CALL ME MADAM and OUT OF THIS WORLD. Theodore S. Chapin, President and Executive Director of The Rodgers & Hammerstein Organization, has been Chairman of the Encores! advisory board since its inception, and here offers his thoughts on the newest entry in the musicals-in-concert phenomenon. This front-page excerpt from The New York Times illustrates how publicly supported arts improve our communities and our future and needs your voice to survive. Please show your support for the NEA and the arts by writing your congressional representative at the US House of Representatives, Washington D.C. 20515 or the US Senate, Washington D.C. 20510. For more information on supporting the arts, call the American Arts Alliance at 202-737-1727. I hate the word revival. Every time a previously written musical is presented on Broadway, it is referred to as "a revival." The only productions which should be called revivals are those replicating the original production. Hype (and Tony Awards) to the contrary, I wouldn't consider Broadway's recent GUYS AND DOLLS, DAMN YANKEES, or CAROUSEL "revivals" any more than I'd consider a new production of LA BOHEME or AIDA at the Met a revival. Encores! doesn't do revivals. In fact, it doesn't even do productions. 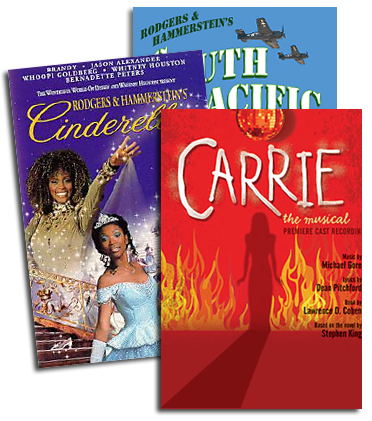 It celebrates musicals from the American repertoire in classy concert presentations, for four per-formances only. The rules are simple: one week of rehearsals, orchestra on stage, actors holding scripts, scenery and lighting evident but simple, costumes a variation of evening clothes. "Encores!" observed Village Voice writer Ross Wetzsteon, has "found a territory half-way between mega-extravaganza and gathering around the piano that's at once enchanting and disarming." The "gathering" has so far has included stars like Faith Prince (FIORELLO! ), Tyne Daly (CALL ME MADAM), Andrea Martin (OUT OF THIS WORLD), Patti LuPone, Peter Gallagher and Bebe Neuwirth (PAL JOEY), and such directors as Susan Schulman, Charles Repole, Lonny Price and this season's artistic director, Walter Bobbie. Serving as musical director is Rob Fisher, with individual productions choreographed by Lar Lubovitch, Kathleen Marshall and Joey McKneely. Clearly, these aren't "revival" people. There is an inherent paradox to staging musicals in concert, which evoke the size and scope of original productions even as the forced limitations of the concert setting focus special attention on the musical's heart: its book and score. Encores! seems to have managed this hat trick quite well, earning praise for both its staging - and lack thereof. For instance, Vincent Canby of WQXR Radio said the CALL ME MADAM concert "swept along with such imagination and style that it was almost as good as seeing a full staging of the show." On the other hand, the Encores! concert presentations have confirmed that even lesser-known musicals from Broadway's golden era can flourish without pyrotechnics. Reviewing PAL JOEY for USA Today David Stearns said, "Here, the sets were never missed: There was too much theatrical heat radiating from the City Center stage." In Newsweek Jack Kroll stated: "Encores! cuts to the heart of the matter: no fat, no Broadway baloney. Just the sound of the American heartbeat when it really had rhythm." Through the Encores! concert performances audiences have a chance to rediscover musicals that may have been overshadowed by more famous works in the same composers' canons, or lost in a Broadway season that might seem miraculous by today's standards. Ultimately, in its display of Berlin, Porter, Weill, Gershwin, Rodgers, Hart, Hammerstein, Bock and Harnick, Encores!, in the words of the Daily News' Howard Kissel, "is a reminder of how much sheer fun it used to be to go to the theater." Ultimately, Encores! is a celebration. The brain child of Judith E. Daykin, City Center's President and Executive Director, Encores! exists to celebrate the musical theater and to celebrate City Center. Once upon a less expensive time, City Center was a place where musicals were seen every year. Now Encores! has found a way to revive that tradition, and its mission is vital: if the musical theater is to have a future, it is crucial that we check in with the past, remembering that it all starts with the words and music. Let's hope new generations will experience unfamiliar shows through Encores!, become accustomed to the habit of going to musicals, and help keep this most American of forms alive.